Measurement of the product characteristics – Ледомер. Георадар. Контрольно-индикационный прибор Пикор-Лед. Официальный сайт ООО "ФПК "ЭСТРА" производителя георадара Пикор. Measurement of characteristics of manufactured radio-electronic products is an integral stage of electronic design, especially in the case of the first prototypes. Besides, verification of the declared parameters of the acquired products is very important. For these purposes can be used testing equipment of ÈAS "MSR-Impulse", which is used by experienced specialists and issues complete reports on carried out measurements. Depending on product type, the whole set of the available equipment in its various configurations can be required for obtaining characteristics of the product. All characteristics of signals in field of timing will be measured with help of oscillograph, characteristics in field of frequency area will measured with help of spectrum analyzer, and all amplitude-frequency characteristics of the path will be measured with the help of vector network analyzer. 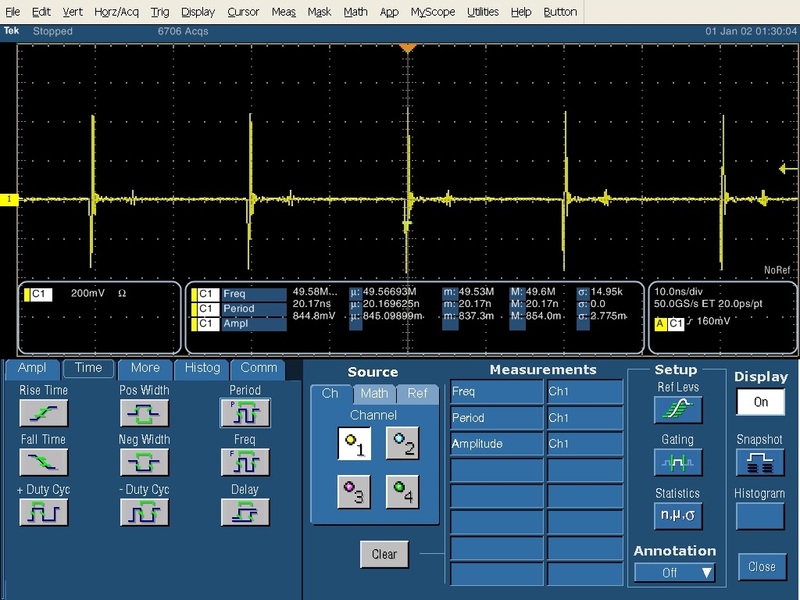 EAS "IDS-impulse" uses oscillograph Tektronix TDS7404B as a signals tester in the field of timing. This device allows you to record both analog and digital signals in the frequency range between 0 up to 4 GHz with maximum sampling rate (in real time) at 20 GS/s equivalent-time sample rate up to 1 TS/s. 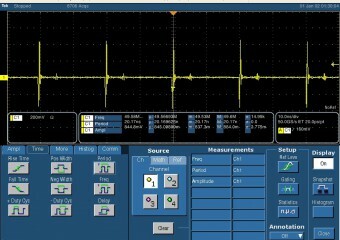 The oscillograph allows to register single-pulse signals with duration less than 1 ns in enrollment mode in real time. At registration of repeating signals resolution time of the two reference points can be up to 30 ps. The above oscillograph is used technology of digital phosphorus (DPO), which allows quickly identify abnormal signal elements (pulse interferences etc.) with their indication the corresponding gradation of brightness. The oscillograph has 4 independent input channels, which allows conducting research of independent signals in real time. Multifold possibilities of mathematical processing of signals allow performing mathematical operations between signals and carrying out signal spectrum appraisal in real time. The device contains the option of connecting to GPIB protocol which allows to perform remote control of the device and data sampling without intimate contact with the device. This option is especially useful at carrying out automatic calibration using power meter. In this case, connect two devices with the analyzer using high-frequency cables in accordance with the user’s instruction as well as GPIB cable. Power meter compare indexes of test signal power received from Analyzer with standardized indexes and then sends corrective coefficients to the Spectrum Analyzer. Usage of the Spectrum Analyser with measuring antenna makes it possible the evaluation of radio situation on air at current time. Using function of accumulation of the maximum indexes of air signal on infinite time, it is possible to carry out tuning-out frequency of researched product at work on air. This is important when you are working with pulse signals. So to estimate the average spectral power of pulse signal radiated in air, it is necessary to make a record with a long sample of air, then turn on the second channel of the Spectrum Analyzer and switch on pulse transmitter at a fixed distance from the measuring antenna. Thus it is necessary to leave a mode of accumulation of maxima on infinite time switch on. 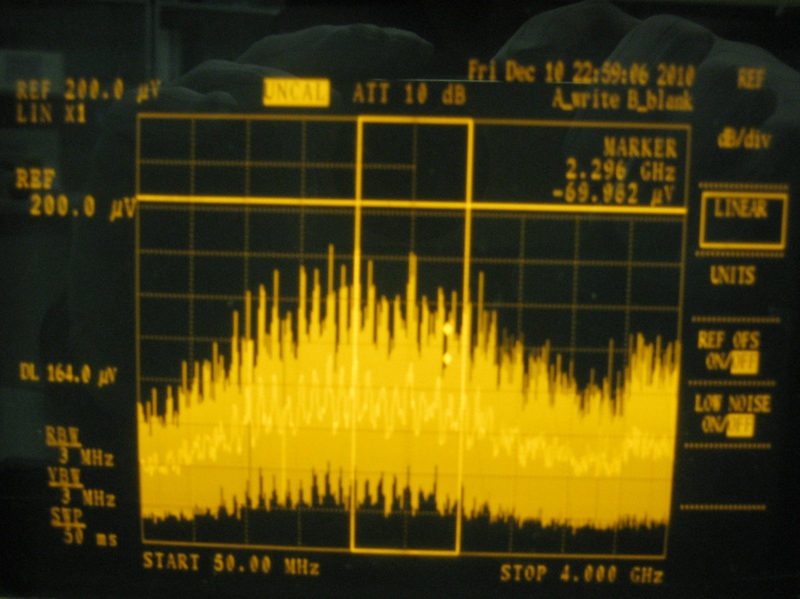 Using the function interchannel mathematical computation, one can subtract the signal from air, recorded in the first channel from the signal recorded while pulse radio transmitting device was switched on. Spectrum Analyzer also allows making audition and division between the channels with subsequent recording in one of the channels. To estimate the average values of power at a time of the pulse signal, one can use moderation function on finite sample in time. Spectrum Analyzer also allows recording the measurement configurations for different types of signals and various conditions of measurement. Such function is required when carrying out similar tests with the same conditions of measurement. 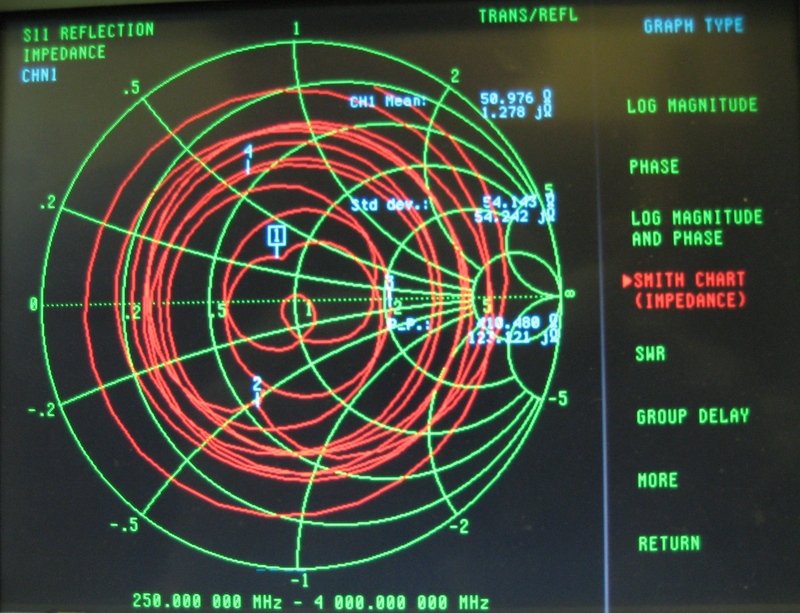 The major device as a part of EAS "MSR-Impulse" is the Vector Network Analyzer Anritsu MS4623B. This device allows to measure full matrix S-parameters of 3-port system in a frequency range between 10 MHz to 6 GHz. To reduce the value of the relative error and exception of the measuring cable path, it is necessary to use calibration sets in this frequency range. The functional enhancements include Auto-calibration module, plug-in with GPIB interface to the device and carrying out calibration of the vector analyzer of circuits in an automatic mode. The frequency resolution the Analyzer is 10 Hz, with a maximum sampling of 1601 points of measuring in the chosen frequency range. The Vector Network Analyzer is equipped with options of connection of additional monitors and printing function with the help of plotter/printer. Connection of the Analyzer via GPIB interface to the general gate unit allows to carry out remote measurements, and also to receive data in the protected long-term storage without direct contact with the equipment. This function is especially important at carrying out measurement of characteristics of coordination and data transmission (reflectance factor, standing wave ratio, transfer efficiency of system of two antennas) of antenna or systems of antennas since in this case placement of antennas is on dielectric supports and influence of an operator of the device on measurements should be minimum. Using an external keyboard and an external display it is possible to reduce influence of Vector Network Analyzer operator on measurements of harmonization characteristics which is also important. The Vector Network Analyzer can be used as a frequency analyzer of the environment. For this purpose it is necessary to collect the system of two identical antennas, calibrating the closed lines of this antennas system. 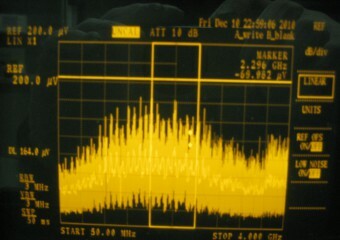 After that, it is possible to make analysis of frequency characteristics of the material placed between these antennas. 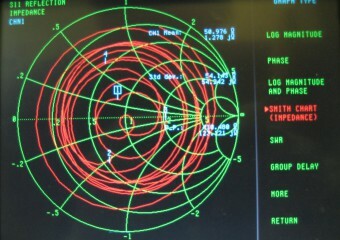 Such investigations can be useful when creating articles of subsurface radars and surveillance systems through opaque environment, since at creation of such devices to signal propagation path modeling creation of a forehand, since at creation of such devices it is necessary to carry out modeling of the path of signals distribution before the beginning of creation of such kind products.